Engineers, artists, scientists and more will bring their latest creations to Reston later this month. The fourth annual Maker Faire NoVa event will take place Sunday, March 19 from 11 a.m. to 5 p.m. at South Lakes High School and Langston Hughes Middle School. Featured “makers” at this year’s event will include HackRVA with their giant spirograph, miniature racing quadcopters and more; and DorkPod with their experimental personal-mobility device, among others. More than 100 makers in total are expected to share their knowledge through hands-on projects, demonstrations, workshops and more. Robotics, drones and 3D printers are just some of the many types of technology expected to be on display. 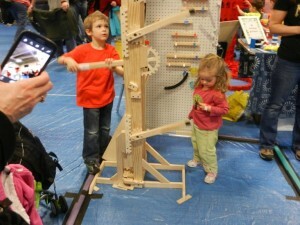 The event was known as the Mini Maker Faire in previous years. The “mini” has been dropped from the name this year as the event’s scale and scope have expanded, according to the press release. In 2016, nearly 200 Maker Faire events were held worldwide. Advance tickets are $2 for children ages 2-18 and $13 for adults ($10 for seniors) and can be purchased online. Ticket prices increase by $2 at the door. A family ticket package is also available.